The spear-shaped end and paddle-shaped (half-round)end of this imported Italian rasp provide a unique duo of slightly curved carving shapes for the wood and stone carver. The A5520 has medium coarse hand-punched teeth in tight proximity to each other allowing the carver to tackle flat, rounded areas as well as tighter spaces. Both ends of this rasp are very slightly curved like a bent finger. Made from C100 Italian carbon steel with teeth on both sides of the rasp and along its edges providing complete tool usability. 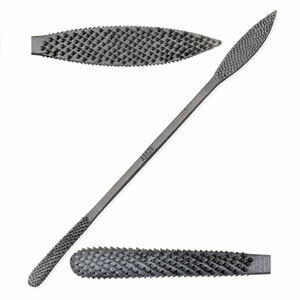 Replaces the R27 Small Riffler-Rasp.